On May 20, 2018, the Bolivarian Republic of Venezuela held Presidential, Municipal and State Legislative elections. By far the biggest result was the reelection of President Nicolás Maduro for a new term (2019-2025) with over 6,192,000 votes or almost 68% of all valid votes. The Venezuelan Electoral Council reported participation at 46%. The Bolivarian Republic of Venezuela repudiates and protests the decision by the government of the United States of America, of imposing sanctions against Venezuela’s Head of State, Nicolás Maduro Moros, consummating a serious violation of International Law, and an infringement upon his human rights, constituting an unfriendly action against Venezuela. Likewise, it rejects the insolent and distempered remarks of the National Security Adviser to the White House, H.R. McMaster. These sanctions constitute a retaliation against President Nicolas Maduro for having convened the electoral process of greatest magnitude in recent times in Venezuela, for deepening democracy and sovereignty through the activation of the original constituent power, for being a defender of the dignity of Latin America and the Caribbean, and for fiercely opposing white supremacy in the U.S. presidency and its Ku Klux Klan vindicating racism. 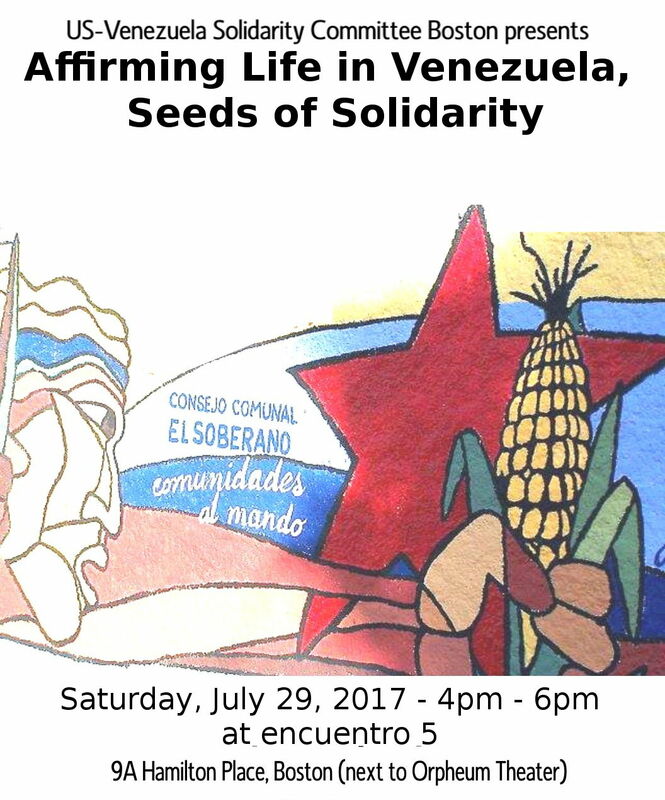 The event organized by the Venezuela Solidarity Committee on July 29, 2017, was a successful display of solidarity with the Bolivarian Revolution. 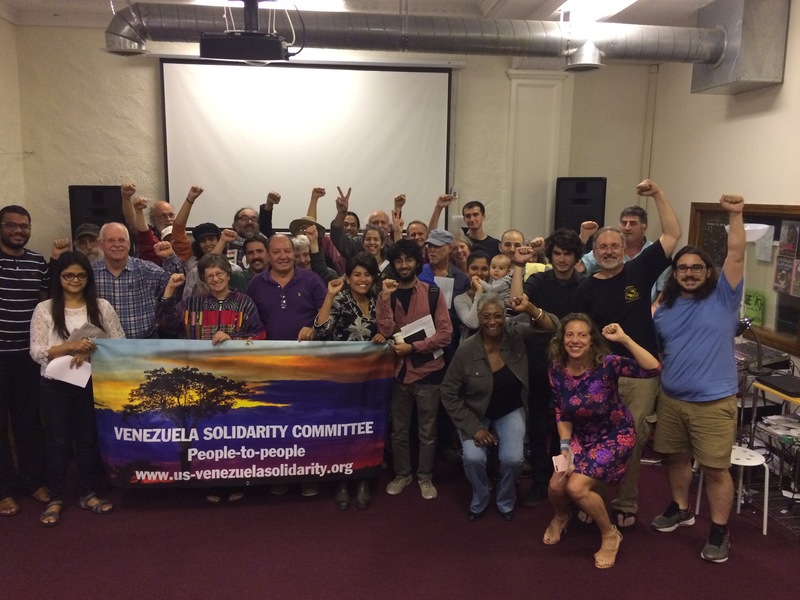 The event was entitled “Affirming Life in Venezuela, Seeds of Solidarity” and was co-sponsored by the following organizations, the International Action Center, CISPES Boston, the July 26 Coalition, Encuentro5, Chelsea Uniting Against the War, Socialist Party, Party for Socialism and Liberation, Communist Party – Boston Branch, Boston May Day Coalition, United for Justice with Peace, Alliance for a Secular and Democratic South Asia, Workers World Party Boston, Democratic Socialists of America. Their statements of solidarity with Venezuela can be read here. As part of the program there were songs by Ali Primera, interpreted by Sergio Reyes, a report on current situation in Venezuela by Omar Sierra, a video recorded in Venezuela, a report from the recipients of our seeds of solidarity already sent (the video can be seen in YouTube here), and a presentation by Jorge Marin, member of the VSC, about our work and the need to demand that our country, the United States, stop its intervention in Venezuela in support of the right-wing opposition. There was also a rich discussion during the questions and answers period. In general, all present expressed their support for our people-to-people solidarity campaign, and their support for social change campaigns started by the Government of President Hugo Chavez, and continued by Nicolas Maduro. A generous amount of money was collected towards buying and sending organic, non-gmo seeds to our friends in Venezuela. Our thanks to all who attended and supported this event. To download flyer click here. In their feverish attempts to overthrow the democratically elected government of President Nicolas Maduro in Venezuela, the right-wing opposition is resorting to criminal terrorism. Their criminal actions show an utter disregard for human life. Among other acts of terrorism, they are using lynching, complete with racist and classist intent. On June 3, 2017, Orlando Figueras, 21, Afro Venezuelan, was attacked on his way to work in Caracas. He was punched, stabbed with knives, sprayed with gasoline and set on fire by masked right-wing protesters. This horrific act of racism was captured on video. Orlando, unfortunately for him, looked “Chavista”. The truth is that the victim had no political affiliation. This was, plain and simple murder by lynching.